Highly valued by collectors, sporadic mining means that morganite isn’t frequently seen in many jewelry collections. However, those who’ve handled this variety of beryl are quickly impressed by its unique pink to a peach color range, rare among other types of beryl gemstones. A true stone of romance, morganite is valued for its soft feminine color palette and its association with love and relationships. It’s one of the most meaningful stones one can give to a lover or partner. Morganite occurs in several locations, but material from Marropino continues to dominate for its quality. Is Marropino morganite valuable? The value of colored stones is typically determined by a combination of its color, clarity, cut, and carat weight. This is no different when determining what Marropino morganite is worth. These guidelines will help you choose morganite stones for your collection. Occurring in a range of gentle pastel color, Marropino morganite occurs in a variety of hues ranging from a soft, tender pink to peach to salmon, with subtle variations in between. Most stones display light to medium saturation of color, with larger gems frequently displaying a greater depth of color. However, the most intensely saturated stones are rarely practical for use in jewelry, making darker stones a rarity. In morganite, pink is the most common and desirable color, but many regard a deep magenta as the most valuable. Many collectors prize the peach tones of untreated morganite, as they are more unusual to find available for sale. Beryl is a colorless material, and in this form is known as goshenite. Trace amounts of manganese are what create this captivating hue in this pink beryl. As a Type I gemstone, morganite is typically eye-clean. This means there are no inclusions visible to the naked eye. If they’re present in polished stones, these inclusions will typically be hidden when the stone is set. Should they be present and noticeable, inclusions in morganite can lower its value. You can expect to find morganite in both traditional shapes, like the round brilliant, and fancy shapes pears, marquis, and more. The primary challenge faced by a lapidary shaping the stone is its pleochroic nature and lower saturation of color. A gem cutter must consider these two factors as they shape Marropino morganite gemstones. Their goal will be achieving the finest color they possibly can while providing the largest stone possible. While morganite is rarely seen compared to many other stones, that doesn’t mean large specimens are entirely out of the picture! Marropino morganite occurs in large crystals, meaning you can expect to find finished jewels of many different sizes. Because of this, there is not a noticeable difference in price per carat for larger stones by size alone. Large stones of profoundly saturated color typically will command a premium over stones of similar size but less desirable color. Finally, untreated stones of peachy hues have a smaller market. There is less market demand for peach stone as there is for pinker ones. At Shop LC, stones above 5.5 carats are rarer, and most gems exist in a size range of 4mm by 4mm to 12mm by 12mm. Many stones undergo additional treatment, either to increase their beauty of durability. A commonly accepted practice, morganite commonly undergoes annealing, a type of heat treatment. In addition, the stones undergo irradiation. Together, this improves the color of the gem, removing the peach and salmon tints and producing pinker stones instead. This treatment has good stability and is permanent with proper gemstone care. Ranking 7.5 to 8 on the Mohs scale of hardness, this pink beryl is very resistant to scratching and abrasion. 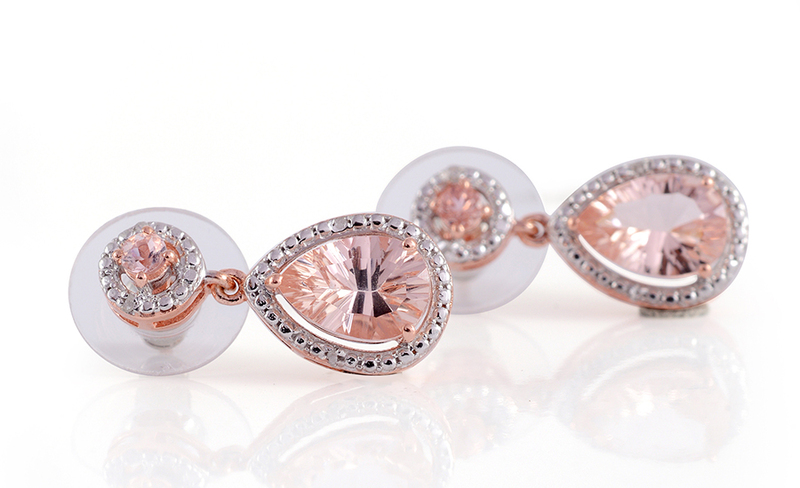 Combining with good toughness, morganite is nicely resistant to chips or breaks. Morganite jewelry is a good option for daily wear. The best way of caring for morganite jewelry is by cleaning it with a simple solution of mild dishwashing liquid soap, lukewarm water, and a soft bristled brush such as a toothbrush. Just scrub it gently with the mixture until it looks clean and rinse it with crisp, clean water. Dry the jewelry with a soft lint-free cloth and you are done. Ultrasonic and steam cleaners are safe to use for morganite jewelry, but avoid them if your stones are highly included. Prolonged exposure to heat and light may cause the color of your gem to fade. Avoid exposing jewelry to harsh chemicals, such as everyday household cleaners. The best way of storing Marropino morganite jewelry is in a lined jewelry box. Store pieces of jewelry away from other items in your collection to prevent accidental damage. When not worn, you can also store jewelry by wrapping it in a soft cloth and placing it safely in a drawer or similar area that is away from light or heat. While Marropino morganite is typically available in all standard cuts and styles, this stone has a special relationship with rose gold. Embracing its reputation of feminine allure, rose gold is a popular choice for this gem. The rosy pink metal further highlights the delicate pastels of the gem, making these colors more pronounced. It’s a popular choice for delicate jewelry as well, and many pieces of morganite favor minimal designs that only combine this pink beryl alongside rose gold. Colored stone engagement rings continue rising in popularity. While sapphire remains the most popular choice after diamond, more brides-to-be are embracing the rarity and uniqueness of pink morganite. An especially popular pairing is using a cut other than the traditional round brilliant. Two of the most popular styles involve using pear-shaped stones, or longer stones in east-west settings, such as oval or marquis. While morganite emerges as a popular trend in engagement jewelry, it’s not commonly given as an anniversary gift. It just isn’t as widely known in jewelry circles as other varieties of beryl, such as emerald or aquamarine. Some might prefer considering this rarer stone as an alternative to these traditional anniversary gifts. How Does Marropino Morganite Compare to Other Pink Stones? Pink is a powerful color, and we associate pink with feminine energy. When we compare the peachy and pink hues of morganite to other pink gems, what should we expect? Marropino morganite shows a softer pink tone than many other popular pink gems, such as pink sapphire. Where the pinks of sapphire are often vivid, intense, and bright, pink morganite is subdued and subtle. Choose pink morganite for making a statement in conservative environments where the brashness of brighter stones simply won’t do. Softer hued stones, such as kunzite, frequently display a similar showing of color. However, the pinks of kunzite also come with elements of violet and purple and make themselves distinct from morganite. These stones play well together, and you’re safe when choosing morganite where you might instead consider kunzite jewelry. Pink diamond and pink morganite are very close to matching one another. Both stones showcase delicate rosy hues. The color of a pink diamond is all natural, whereas the pink of morganite is commonly achieved through treatment of the raw stone. Some may prefer the prestige that goes with knowing their jewel is entirely natural and choose a pink diamond. However, only morganite will occur in larger sizes, as Mother Nature herself limits the size of pink diamonds coming from Argyle, Australia. Where Does Marropino Morganite Come From? Morganite was first discovered in Madagascar in 1910. Since then, it has been found in Afghanistan, Mozambique, Myanmar, Namibia, Pakistan, and the United States. However, the finest quality morganite is credited to the Marropino Mine of Mozambique. Unfortunately, despite a hungry market for this gem, sporadic production keeps morganite from going mainstream. A complicated series of relationships holds back regular production of morganite. Marropino is also home to large deposits of tantalum, an instrumental metal utilized in a variety of commercial applications, from transistors to turbines. Tantalum and morganite both occur in the same pegmatite rocks found scattered throughout the mining area. As the market waxes and wanes for tantalum, this also impacts operations to recover morganite. Much morganite is recovered as the result of these large-scale operations. However, the lack of available infrastructure further complicates mining in this area. Efforts from major operations are addressing this issue, but progress can be slow. In addition, artisanal miners also operate in this area, recover both tantalum and morganite, in addition to other minerals. Many artisanal miners are seasonal workers who use mining as a means to supplement an income from farming or other trade dependent on seasonal changes. Beryl is a stone of protection, perfect for ensuring safe travels. Also, the stone enhances feelings of love and is used to strengthen marriages. Of all the varieties of beryl, morganite is especially strong in this regard. 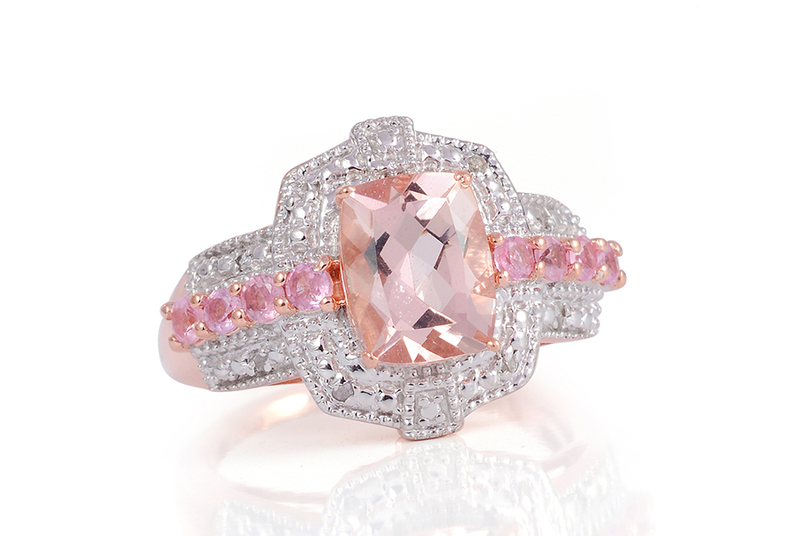 Morganite enhances one’s charisma and is especially useful for increasing your appeal to potential romantic partners. 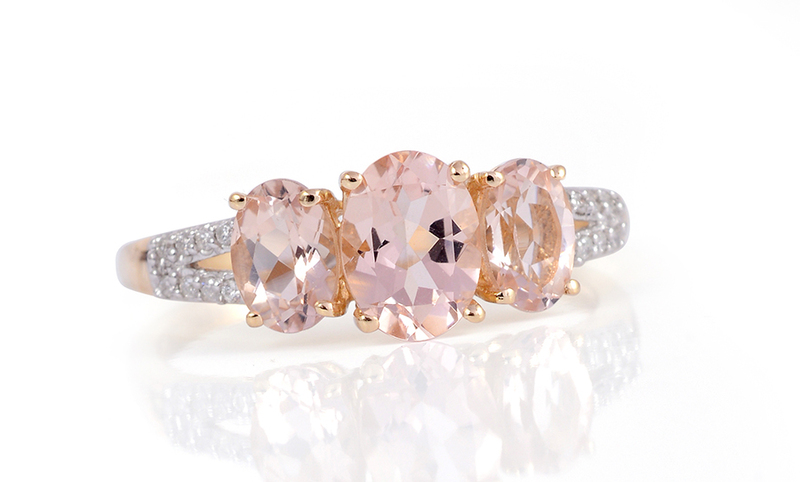 Morganite is not a modern birthstone by US tradition. Some may prefer this pink beryl as an alternative to other beryl birthstones, such as aquamarine for March or emerald for May. Morganite ranks 7.5 to 8 on the Mohs scale of hardness. Marropino morganite ranges in color from pink, rose, salmon and peach. The most widely regarded source of morganite is the Marropino Mine of Mozambique. 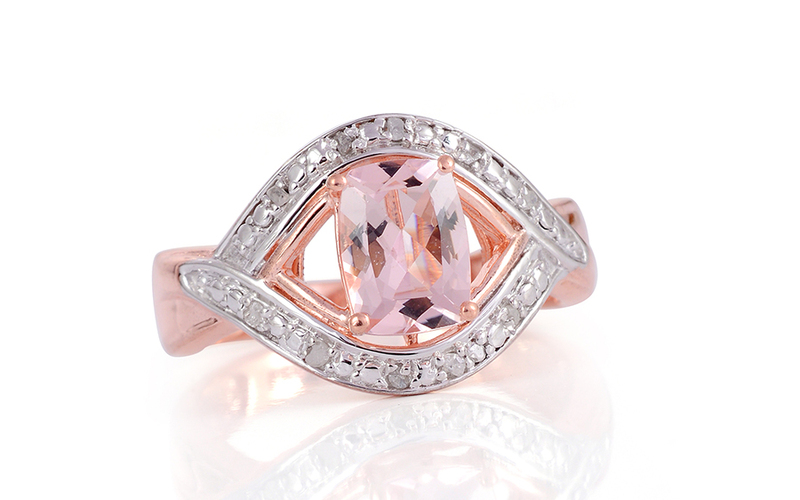 Morganite commonly undergoes annealing and irradiation to improve color. Morganite is sometimes called pink beryl.